Regional instability and conflict have often frustrated U.S. leaders' aspirations to pivot away from the burdens of military operations in the Middle East in order to shift resources to other parts of the world. As the U.S. Army looks across the Middle East and North Africa in 2018, it can anticipate and should be prepared for its current involvement there to extend into the future. There is little prospect that American military actions can resolve fundamental problems in the Middle East beyond the destruction of the Islamic State of Iraq and the Levant's (ISIL's) would-be caliphate. However, regional conflicts, plotting by ISIL and al-Qa'ida from safe havens, or U.S. partners embroiling themselves in military operations that turn out to imperil their own security could cause the U.S. president to consider options for intervention. Therefore, it will be crucial for Army leaders to be able to play a leadership role in future deliberations about the role of U.S. military power in the region, and the Army will need to prepare and posture its forces so as to be able to deal with such contingencies when necessary. 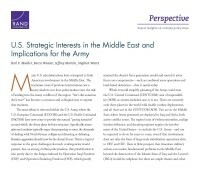 This perspective examines threats to U.S. interests in the Middle East and factors associated with success and failure in U.S. military interventions, and offers recommendations for the Army as it prepares for future involvement in the region. This research was sponsored by the United States Army, and conducted within the Strategy, Doctrine, and Resources Program, of the RAND Arroyo Center. Mueller, Karl P., Becca Wasser, Jeffrey Martini, and Stephen Watts, U.S. Strategic Interests in the Middle East and Implications for the Army. Santa Monica, CA: RAND Corporation, 2017. https://www.rand.org/pubs/perspectives/PE265.html.